Middlesex University students have scooped numerous awards in the 2014 D&AD New Blood competition, which recognises the very best in student, graduate and young creative design and advertising. Two final year students won a coveted Yellow Pencil Award; while a third was offered a place at D&AD's New Blood Academy. 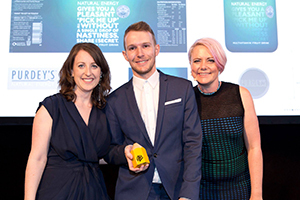 Yellow Pencil winner Vivien Lambert, a Graphic Design student at Middlesex, received his award for redesigning some of the packaging for the Purdey's drinks brand. He came up with concept of light-sensitive bottles, which use photochromic inks on labels. The technology means that, when a bottle is hit by direct light, a message appears revealing the ingredients in the drink and the benefits the drink provides. Tereza Cervenova, a Photography student at the University, also won a Yellow Pencil, for her photograph 'Family Matters' of her younger brother and sister. Tereza submitted the photo taken on a family holiday in Greece in 2013 in response to the brief set by Nokia to 'Revisit the idea of the 'decisive moment''. The final year students were awarded the respected industry prizes at a ceremony in Brick Lane this month. Gary Curzai, another Middlesex Graphic Design student and the winner of a place at the New Blood Academy, explained what the experience meant to him: "I'm so excited to be accepted into the Academy. It's fantastic to be surrounded by young designers and creatives from around the world - and we're given amazing speeches by leading designers in the industry. "Every day is completely different to anything I've experienced before. There's a huge range of activities, and lots of focus on improving the creative industry by making positive changes in the world and promoting a more sustainable lifestyle." During the two week experience, attendees are pushed to their creative limits through a non-stop programme of talks, workshops and live challenges. They are also given the chance to meet and work with top agencies, brands and industry professionals. This year's Middlesex students follow in the footsteps of last year's photography graduates, who also achieved success at the awards. William Lakin won overall winner of the photography section and received the top Yellow Pencil award in Photography, while Michelle Amosu was awarded won the 'Best of year' accolade.